In 1971 a group of men chartered an old fishing boat, the Phyllis Cormack, rechristened the Greenpeace, to take it to Amchitka island, on the far side of the Aleutian chain to protest a planned nuclear test by the American military. 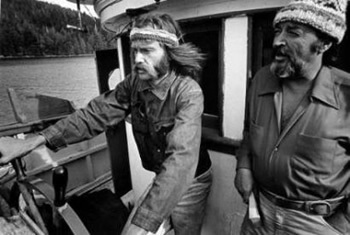 Though they never made it to the island and the test went off (it was the last test done there, however), their trip created a wave of publicity and they formed the Greenpeace organization upon their return. Robert Hunter, the author of this book, was on the boat and was one of the founding members of Greenpeace. It's his memoir, written almost immediately after the trip, though unpublished until a few years ago. He put the manuscript away because he had made a pact to show a unified face to the world, to hide the many internal divisions that plagued the birth of Greenpeace. I'm glad he did finally decide to pick it up again and publish it, because it's a fantastic read. He's an entertaining and skilled writer and was clearly cranking this out when it was fresh in his heart and mind. It really captures the feel of the time. His prose has strong resemblances to Thompson, Kesey, Tom Wolfe. And the story is quite exciting. A group of freaks, piloted by an old school captain and his old-timer engineer, chugging their way up the Alaskan panhandle, stopping in native Aleut villages and cannery towns, passing abandoned fisheries as the internal and external tension builds makes for a very gripping narrative. On top of that, there are some real conflicts with the ocean, which sounds like absolutely no joke up there. The trip through the storm at the end is as exciting as any Jack London story. Going in, I thought the environmental politics on display here would be a bit primitive. It is sort of disheartening in one sense to see that their concerns about the planet were just about the same as today's. I say disheartening, because the sense of urgency seemed just as extreme then and we haven't done anything in the convening 40 years to stop man's mad path of destruction. The book ends on a very discouraging note as Hunter had completed the manuscript basically feeling as if the entire trip had been a failure. There is a more optimistic afterword that was written around the time of publication where he is pretty psyched by all the good work that Greenpeace has done. Robert Hunter died last year, of lung cancer. You can read a bit more about him and his later work here. I had never heard of him before this book, but it's clear that he was a radical, a freak and a fighter and we need more people like him in the world today. I found this book at a giant municipal book sale they have every year in Montreal. It's held in a hockey arena and is mostly old library books. It's a large format hardback by two of the journalists working the story of the standoff at Oka in 1991. There are quite a lot of photos and I have to credit Robert J. Galbraith who was the photographer (I didn't want to make the title of this post too long). There are plenty of websites dedicated to the actual event and some of you may remember it from the news. Basically, the town of Oka, which is right next to the Mohawk reserve Kanesatake, wanted to expand it's golf course from 9 holes to 18. The new part of the golf course would be built on top of a pine grove that the indians considered sacred. They used it as a burial ground and a place of ceremony. From this book, it's not really clear who actually 'owned' the land. I guess it wasn't part of the reserve, from Canadian law. The town council approved of the development and when they went to tear up the land, the natives had set up a blockade. The town sent for the Sureté de Québec, which is the provincial police force, who quite quickly attacked the blockade (which was mostly women and children) with teargas. A firefight ensued and one cop was killed (though most of the bullets were fired into the air). After that, a standoff ensued that lasted several months. Another reserve, the Kahnawake to the south, blocked off a bunch of roads in sympathy, including a major commuter bridge into Montréal. Eventually, after much negotiation, posturing and pressure (both militarily and political) the protesters were pushed into a smaller and smaller area. The Canadian army came in, replacing the SQ. The federal government bought the land from the town council (for millions of dollars, all of which came out of the Ministry of Indian Affairs' budget; i.e. was going to be used to help the natives). A few of the warriors (as they called themselves) were arrested. The provincial government were a bunch of pricks, the feds basically useless and the people of Kanesatake are still having the same social problems today. The book follows the standoff from beginning to end, with lots of little asides, like interviews, small histories, quotations). It is clearly sympathetic to the native people, though they do make an effort to be objective. They point out that the natives were the most open with the media, inviting them to stay with them on their side of the blockade, being very free with information while the army and the quebec and canadian government kept them shut out. The people who really come off bad in this book are the white people of Québec from the region. 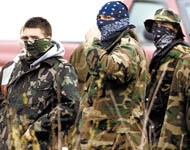 As soon as the bridge connecting them to Montreal was blocked off, local roughnecks came to the blockades, yelling racial slurs and throwing rocks at the natives. Early in the standoff, two people were dragged from a nearby grocery store and beaten because they were though to be natives (they were wearing camo pants and just had dark hair). For the SQ, the white protesters became almost more of a problem than the native blockades because they started to pelt the cops with rocks and bottles, angry that they hadn't cleared their precious commuter route. It's very easy to get angry when reading a book like this. The greed and selfishness and utter disrespect (that word is way too mild and simplistic for the reality) given to the natives is just astounding. You're going to call in the provincial army because you can't build your little 9 hole golf course? When the SQ came in, the reason they first shot the tear gas was because nobody would represent themselves as a spokesperson for the natives. The Iroqouis tradition has always been a communal one and when the cop approached the group of natives (all women and children) they kept telling him that they all were the spokesperson and that he should talk with them. So he teargasses them. Coming to Canada after living for almost 10 years in the States, I had a feeling of living in a relatively democratic country. But Democracy really is relative and if you're a native, you're basically fucked. The 5 nation confedaracy that welcomed Champlain to Canada considers that they allowed the white man to come and use their land. According to their system of laws, land is owned by the ancestors and is made available to anyone who needs it. They consider that we took advantage of that and are now claiming to own this unownable land. Obviously, it's untenable for them to cling to any realistic hope of the current system respecting their traditions. Even within the tenets of our system, we are screwing them. The hierarchical political system the Canadian government has imposed on their communities creates a tiny cadre who control all the money and usually just steal or waste it. Kanesatake is no better off today. In the last year, the reserve almost disintegrated into civil war when one group burned down the chief's house. He had secretly ordered a new internal police force who I guess were outside officers. It's all so confusing and the information is so scattered. Everyone says everyone else is lying. The people still suffer. We Canadians should feel deep shame about the way the First Nations people are living inside our so-called democracy. This Land Is Our Land gave me an excellent account of what actually happened during the standoff. I'd like to read some more external accounts that might explain in more depth the positions of all the parties involved. I would also like to understand better the infighting inside Kanesatake, though I doubt any book will explain that. The momentum from the beginning of the year has started to dissipate. I've been very distracted these last couple of weeks, and though I can point to a number of valid explanations (new job, two new volunteer projects, three deaths, Diplomacy) I have spent way too much time futzing around on the internet, doing nothing of significance. That thing is becoming like television to me. That's bad. I read Watership down consistenly but slowly, perhaps a chapter or two a night. It's a shame because my distraction was so high that I had trouble getting into the book at first. It's a testament to the craft of it's writing that by the last third, I really couldn't be distracted. It is really an exciting adventure, structured and written to keep the reader engaged. Another reason for my initial slowness was fear. I had seen the movie as a kid and I don't remember much but the ear shredding. The book starts out on such an ominous note that I was spending quite a lot of time waiting in trepidation for the hammer to fall, for some terrible thing to happen to these good bunnies. Moreover, there is a powerful sense throughout the whole book that this terrible thing has already happened, that the land where these rabbits lived has all been torn up for development. Watership Down really is a cry of love for the rural countryside and it's delicate and proper management. I can't help but to compare it with Mrs. Frisby and the Rats of NIMH. Watership Down is slower (until the end), more complex and perhaps closer to reality. The rabbits communicate, but their perception of the world is limited (they don't understand what bridges or boats are or how they work). Adams also pays a lot of attention to their biological behaviour, much more so than is done in NIMH. He has also built a complex religion, history and culture based on the rabbit's biology that gives Watership Down a lot more depth. Overall, it's a cracking good read, a great adventure story. You should read it and it should be read to children.